627 pages | 18 B/W Illus. 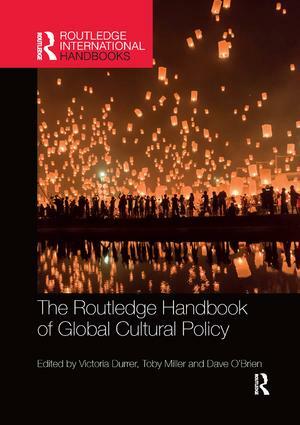 With a cross-section of country-by-country case studies, this comprehensive volume is a map for academics and students seeking to become more globally orientated cultural policy scholars. 27 The international politics of the nexus ‘culture and development’: four policy agendas for whom and for what? 31 Cultural policy in India: an oxymoron? Victoria Durrer is Lecturer in Arts Management and Cultural Policy at Queen’s University Belfast, UK. Toby Miller is Director of the Institute for Media and Creative Industries, Loughborough University London, UK. Dave O’Brien is the Chancellor’s Fellow in Cultural and Creative Industries at the University of Edinburgh, UK.